Hey everyone! I am so, so excited about a new tech tool I just bought! (Ok I actually bought three, but you’ll see why in a moment). I just know it’s going to make a HUGE difference in my class…so naturally I had to share my find with you! It all started with this wonderful blog post I read on Laura Candler’s Corkboard Connections: The Power of Audiobooks. Laura describes all of the benefits of audiobooks, even for older students in 5th grade (you have to read this post, she has a ton of fascinating and helpful information on this topic). I was excited to read this because I really feel the same about the important of audiobooks for fluency and comprehension…not just for my newcomer EL 5th graders, but for my mainstream students as well. In this article, Laura also mentions how she hooks up multiple headphones using adapters, so several of her students may enjoy the audiobook via one source. Did such a thing exist?? (I mean, beyond those big, boxy old-school devices that don’t plug into iPods and computers)? I flew to Amazon and, sure enough, there it was. 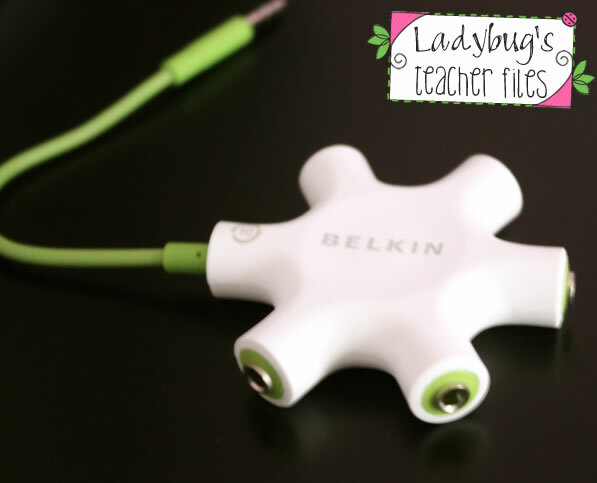 A Belkin Rockstar Multi Headphone Splitter!! My head was spinning…this would change everything! We could take those little bits and pieces of technology we have and really maximize them…to give all of my students access to the tools more often. (we tried this out last week before our winter break…you can fit about three 5th grade students comfortably around the iPad). I’m smiling now as I write this, at the thought of all that technology being utilized to its fullest potential!! I have a bunch of ideas for these little tools and I promise to come back and share all about them very soon (we head back from winter break this week and I’m looking forward to getting them all set up). Have you used headphone splitters like this? Do you have another tool you like to use, to help maximize the tech in your class? I have headphone splitters for my computers and listening centers. I absolutely love them! I just added this Belkin Splitter to my wishlist on Amazon the other day. Guess I am going to have to take it out of my wishlist and purchase it. I have one too but I haven't used it yet. I think the idea is so genius! I didn't think about using it with the iPad. Have a good weekend Kristen! 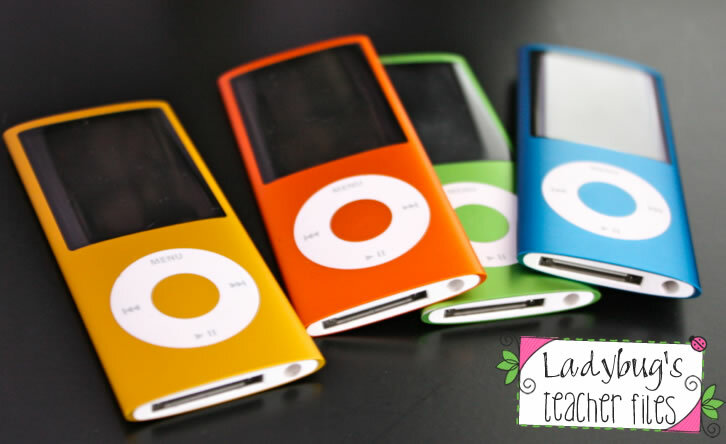 I won one of these from the blogger at Teach~Play~Smile last summer, and my students use it everyday on my one iPad. It's great! A much needed supply for effective use of new technology in the classroom! This is awesome. I've never seen one like this…I'm definitely going to have to find one of these. This would be wonderful for my kinders to use the ipad and other items in my classroom. I have one for my classroom Ipads!! Do your kiddos listen to books on the Ipad? If so, what site are you using? LOVE it! Can't wait to see what other ideas you'll have for us. And now, if you'll excuse me, I'm off to visit Amazon. I had the Belkin splitters a few years ago and a word of caution, be careful of the cord being bent by the littles, both of mine stopped working after about 12 months of use. I got ones that were static to plug in to the computer. So it looks more like a trunk with branches coming off for the headphones to plug in to if that makes sense. I have four of these and they have lasted 2 yrs so far without any complaints. They are great for having groups of students listening instead of just the one. Enjoy your new toy! This looks great. Thanks for the heads-up, Kristen! I have seen these in the stores and never knew what they were. I am so excited now! I will be going to the store tomorrow to pick up two for my classroom to use with the iPads we have. My headstart students are going to love them. Thank you so much for sharing this. I have 3 headphone splitters in my classroom (and have for the last 2 years) and they are awesome! So great for little (and occasionally impatient) kiddos! I have the exact same adapter in my room that I used a lot last year! Only teaching math this year has kept this guy put away….but my brain is churning now thinking of ways I can use it in math!!! I loved your blog post! Thanks for mentioning my Power of Audio book post and improving on my system of using the headphone splitters. Mine were not nearly as good at these. A picture is definitely worth a thousand words here! This is great! I just got 5 iPads for my 29 first graders, and this will definitely allow more of them to use the technology. I'm having a 100 follower giveaway! Stop by for some goodies! I have 4 of these myself. They work GREAT with computers, iPads, iPods, all of it, unlike the cheaper versions that don't! Plus, it works with every iPad case I have found. Love this handy little tool! I originally bought one for a car ride for my own 3 kiddos to be able to watch a movie & I wouldn't have to listen to it the entire drive! But it quickly found it's way into my classroom & it has been very useful! I don't have these for my class, but I definitely need them!!! I agree, I think that audiobooks are important for our bigger kids as well, and with these I'll be able to get a lot more of it in!! Thanks so much for sharing, Kristen! !